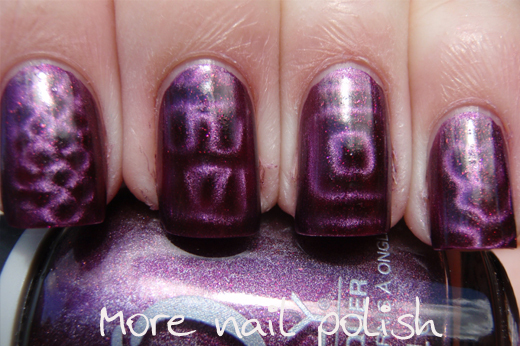 Today I have a couple of the Orly Magnetic FX polishes to share with you. 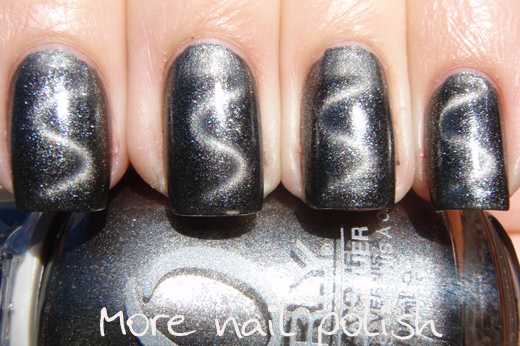 I was very excited when I first saw pictures of the Orly magnetics because the first thing I noticed was they had unique magnets that I had not seen on any other polishes. I've already expressed on this blog my compelling need to own every style of magnetic design available, which lead me to creating my own magnetic designs. So when the opportunity arose to try these out, I was waiting with grabby hands. First is Paint on Electron. This is a dark metallic gun metal grey. After the magnet is applied the grey gets darker and sparklier. As you can see from these photos, Paint on Electron comes with an interesting 'S' design. Unfortunately, as you can also see from these pictures, there is the straight line at the top of my middle and ring fingers where the magnet stopped. I'll explain that in a bit more detail below. I decided to also try out some of my other magnets with this polish which I have detailed both here and here. 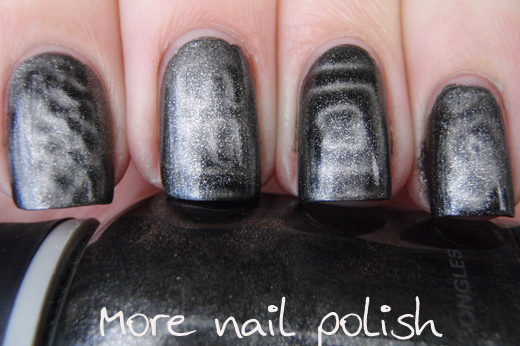 The 'grid' design on my index finger (which this time I turned around to make it like the fishnet design). My 'Aztec' design (which I didn't do very well this time) on the middle finger. My 'concentric squares' on my ring finger. And my 'Flower' design on the pinky. The second polish I have to show is called Force Field. 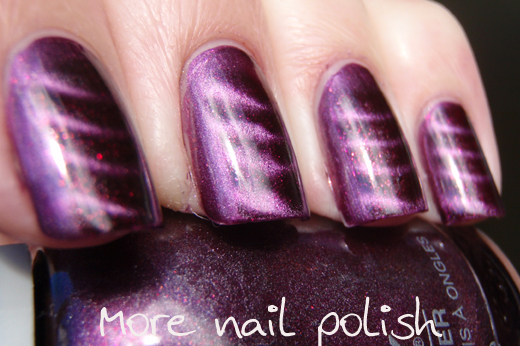 It is a rich pinky purple that goes quite dark and burgundy when the magnet is applied. 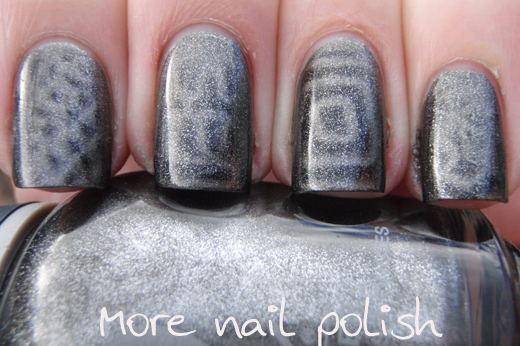 The magnet supplied with this polish is slightly curved lines. This is another unique magnet for me. I have tons of straight lines and quite a few chevrons, but this one is a gentle smooth curve. I've read in other reviews of these Orly Magnetic FX polishes that girls were a little unsure how to position this magnet, specifically relating to the plastic lip or nail guide part I've seen some photos of it being balanced on the cuticle end of the nail - which really doesn't work because it means the magnet is too far from the nail. When I saw the magnet design it really reminded me of my L'Oreal Star Magnet. The little lip (which I have drawn an arrow to), is design to rest the free edge of your nail tip on. The good this about this is that it positions the nail the exact right distance from the magnet meaning a good design whist not touching it. The bad side is that you wont be able to wrap your tip as it will get wiped off, and if you have longer nails, it makes it difficult to position the magnet anywhere but at the tip of your finger. 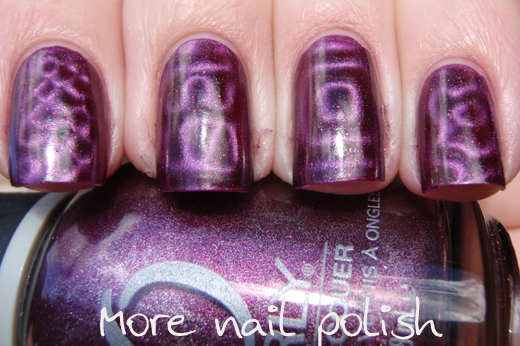 For example, I would have liked to position it more in the center of my nail so the gap at the top was less noticeable. Unique magnet designs not seen elsewhere. Polishes colours are nice and seem well magnetised - there is also a blue which I will have to get my hands on. Strong magnets pull the designs out quickly, you only need to hold it there for a few seconds. 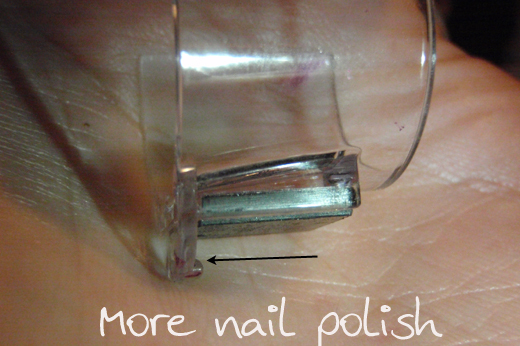 Nail guide makes it easy to keep your nail in the right position without moving it. The magnets are very small. I do admit that I have long nail beds. My nails aren't that long here, only about 1mm past the tip of my skin, but even at this length the magnet is not long enough to match the length of my nail bed. While I considered the nail guide a 'pro' because it helps with positioning the magnet. I'm also listing it as a con because a) you can't position the magnet exactly where you want it on your nail and b) you can't wrap your tips. The magnetic nail polish craze this year has been huge, but I will never tire of magnetic polishes, I think they are pretty, fun and a little bit nerdy. 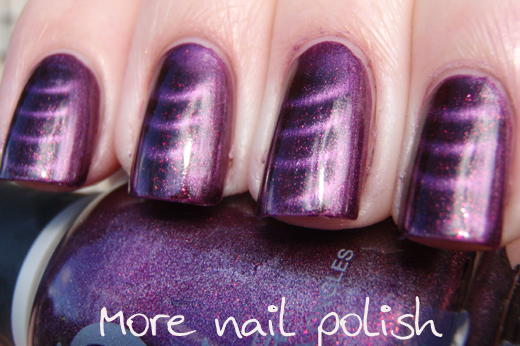 I agree, your designs show up so well in the purple polish! Super pretty. Since you are the go to person for knowing more about the magnetic polishes out there - what's the deal with almost all of 'em being so close in the shade ranges they use? Are there only a few shade hues that can be magnitized? I can see where if a light shade was used, no one would see the design so that makes sense they need to be darker shades. But they all seem to be that same dusky shade. 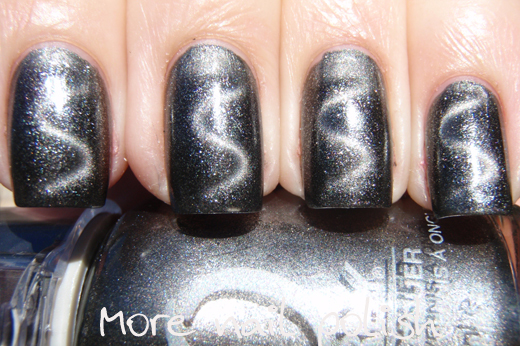 I do like the S design Orly's has. Might be fun to try using it on a diagonal. That purple is lovely! I hope someone comes up with a curved magnet soon. Most of the time the design only appears down the middle of my nails.